The Keeneland January horses of all ages sale is a barometer of, well, nothing. Most years, that is. In fact, the 2009 edition, played out Jan. 12-17, contained exactly that. So, with a less than stellar catalog, and by coming just two months after a lackluster November sale, no one expected much. Still, the numbers speak volumes: gross down 53.4%; average off 48%; and a decrease of 44.1% in the median. But it is not just the stark reality of the numbers. There is meaning behind them. 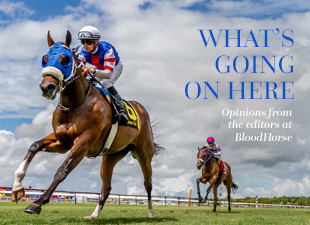 The figures are not only a reflection of the stock that was offered, but rather an ever-present reminder of the bleak economy and how it is affecting the Thoroughbred industry. Many people are simply not spending money. Whether it be on shoes, televisions, houses, or horses, consumers are pulling back. The horses in the January sale that had everything going for them still brought “fair” prices. But more than ever, those that had holes in them had few interested buyers. As in November, many breeders that absolutely didn’t have to sell simply withdrew their horses from the sale, while others, that didn’t have to, did sell, obviously intent on reducing the size of their broodmare band or of dispensing with the cost, and risk, of raising a yearling until the summer or fall. The stock, and the money paid for it at the January sale, are not usually indicators of how things will go at the winter and spring sales of 2-year-olds in training. But the mood of those in the horse business, clearly on display at Keeneland, was as chilly and dreary as the weather in Central Kentucky during the first major Thoroughbred auction of the new year. When pinhookers were buying yearlings last year to resell as juveniles this year, the market was still fairly stable. A great deal has happened in the past six months. So, the question is not if the 2-year-old sales will be down, but by how much? Back in 2003, the five major sales of 2-year-olds in training—Ocala Breeders’ Sale Co. February and March, Fasig-Tipton February, Barretts March, and Keeneland April—grossed $93.67 million. Just three years later that figure had jumped 48.4% to nearly $139 million. Of course, $16 million of that $139 million was for one horse, the disappointing The Green Monkey. However, without the highest-priced horse ever sold at public auction in the equation, the gross still increased 31.3%. Last year the five auctions grossed $111.8 million, producing a hefty average of $194,782 for the 574 horses sold, and more importantly, a record median of $157,500. The past five years the gross at the five sales has exceeded $100 million, so it would be easy to say those who did well in recent years will not have all their profits erased in the expected down market of 2009. However, pinhooking is a game of constantly refilling the tank, using profits for two purposes—to pay down debt from the past and to invest in stock for the future. The 2-year-old market should not be a reflection, however, of the breeding stock sales but rather of the yearling sales. The biggest yearling auction, Keeneland September, was down 14.8% in gross. Ask any 2-year-old consignor right now if he would be happy with the gross of these five auctions being down 14.8%, and the answer is he would not be happy, but ecstatic. A drop of 50%, as in November and January, would have long-term effects on the churn of money through the auction houses. Juveniles purchased at auction are ready to take to the track, and racing, after all, is what this is all about. Their prices should reflect their ability for a quicker return on investment.